“A wave of optimism has swept over American business leaders, and it is beginning to translate into the sort of investment in new plants, equipment and factory upgrades that bolsters economic growth, spurs job creation — and may finally raise wages significantly. “While business leaders are eager for the tax cuts that take effect this year, the newfound confidence was initially inspired by the Trump administration’s regulatory pullback, not so much because deregulation is saving companies money but because the administration has instilled a faith in business executives that new regulations are not coming. “…And with tax cuts coming and a generally improving economic outlook, both domestically and internationally, economists are revising growth forecasts upward for last year and this year. “Even before it became clear that Republicans would pass a major tax cut, capital spending had risen significantly, climbing at an annualized rate of 6.2 percent during the first three quarters of last year. Surveys of planned spending also show increases. “Mr. 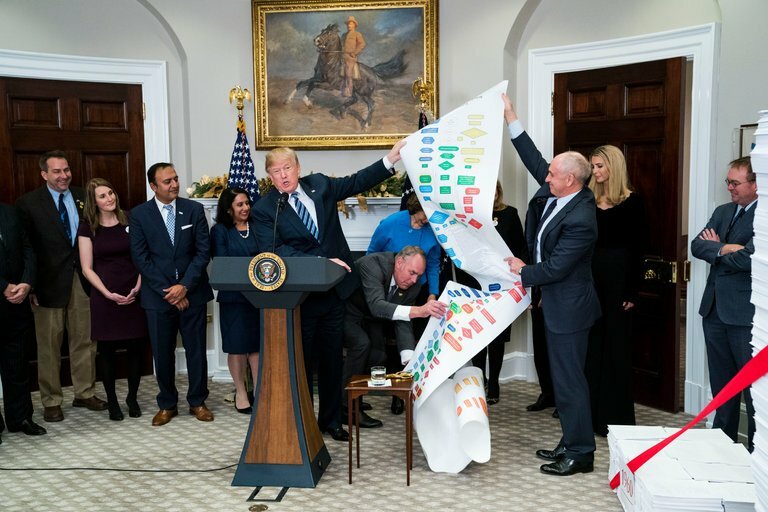 Trump bragged in a news conference last month that he has rolled back 22 regulations for every new one — 67 deregulatory actions, versus three new regulations. Often in conjunction with the Republican Congress, his administration has canceled several rules approved at the end of the President Barack Obama’s term, including a regulation on limiting mining debris in streams, a requirement that broadband providers obtain permission from customers to collect and use online information, and a ban on plastic bottles in national parks. “Administration officials said last month that, since January 2017, federal agencies have delayed, withdrawn or made inactive nearly 1,600 planned regulatory actions. Further rollbacks will affect financial services as well as energy and labor rules, among others. “Businesses acknowledge that the most important reason for their increased optimism is the simple fact that the domestic economy continues to expand, with few clouds on the horizon. “Better yet, the world’s major economies all are growing for the first time since the financial crisis. Confidence among European manufacturers hit a high in more than a decade, according to European Commission data that goes back to 1985, even without tax cuts or less regulation. “But business executives say the Trump administration deserves credit. Mr. MacDonald said home builders have benefited from the killing of regulations written by the Obama administration, including a rule that broadened the definition of wetlands, which could have restricted home building in certain areas. The National Labor Relations Board also reversed a decision that made builders more responsible for the working conditions of their contractors’ employees. “In some industries, the administration’s actions will allow companies to engage in activities they might not have been able to otherwise; electric utilities, for example, might be able to invest in upgrading power plants that run on fossil fuels, thanks to a promised rollback of Mr. Obama’s Clean Power Plan to fight climate change. “The Business Roundtable, a corporate lobbying group in Washington, reported last month that ‘regulatory costs’ were no longer the top concern of American executives, for the first time in six years. Mr. Zandi said that regulation was still the top concern in Moody’s survey of business confidence, but that it was rapidly losing ground to concerns about the availability of labor. “The National Association of Manufacturers’ fourth-quarter member survey found that fewer than half of manufacturers cited an ‘unfavorable business climate’ — including regulations and taxes — as a challenge to their business, down from nearly three-quarters a year ago. “Some industries have seen particularly clear changes in fortune. The Trump administration has reversed a number of environmental protections that would have imposed significant costs on energy companies. Mr. Trump’s appointees to the Federal Communications Commission voted last month to repeal so-called net neutrality rules, which treated internet services as a regulated industry, like power lines, and prohibited broadband providers from charging for faster internet service or from blocking or slowing some websites. “That decision helped prompt Comcast to announce that it would invest more than $50 billion in infrastructure over the next five years. “The banking industry, in particular, has been buoyed by a relaxed approach to financial regulation as the Trump administration moves to ease many of the postcrisis rules put in place to prevent another financial meltdown. The Treasury Department has issued a series of reports calling for sweeping changes to rules required under the 2010 Dodd-Frank law, and a council set up to designate firms that pose risks to the financial system is in the process of removing those companies from heightened federal oversight. “Mr. Trump has also installed individuals who have publicly questioned the need for many of the postcrisis rules in major policy roles, including at the Federal Reserve and the Consumer Financial Protection Bureau. Bank stocks have been on a winning streak and ended 2017 up more than 15 percent, according to the KBW Nasdaq Bank Index. “The confidence is translating to industries that have not, as of yet, seen any obvious benefit or policy changes.